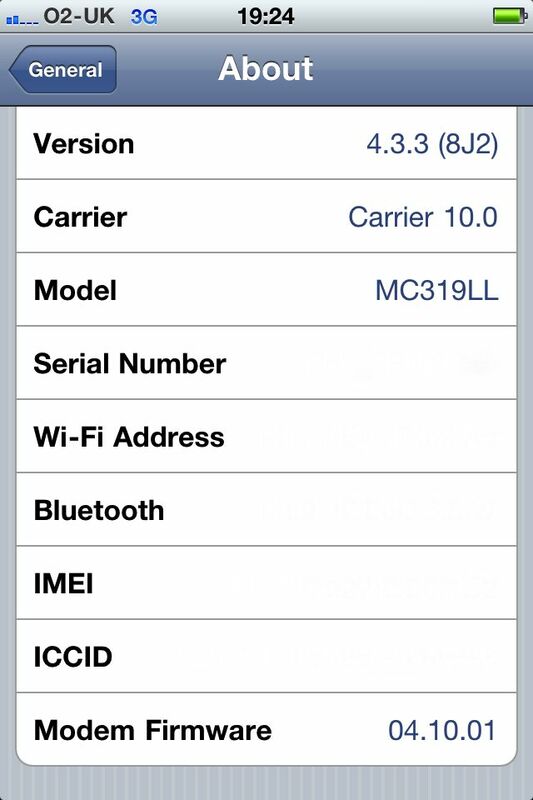 I have a carrier-locked AT&T; iPhone 4 with these specs. As I’m currently living in the UK, I’ve installed a Gevey Ultra hardware unlock. For those of you that use a Gevey card, I’m sure you’re familiar with the suspense of hoping the Gevey “Accept” screen comes up after your phone boots, and the frustration of it occasionally not working at all. What I’ve only recently learned after countless power cycles with no “Accept” screen is that there’s a way to start the unlock process manually. If you boot your phone and the “Accept” screen fails to appear, simply navigate to Settings > Phone > Sim Applications. On the Sim Applications page there will be a section titled Gevey Technology, under which you’ll see a choice of languages. Choose your language and the Gevey “Accept” screen should come up, and you can then continue with the normal unlock procedure. Note that you won’t see the Gevey Technology section if you’ve already completed the unlock process since the phone powered on.